Today we welcome Stacey Güney, director, HLC ACCelerator, Austin Community College as she shares with us how the rebirth of the physical shell of the Highland Mall has led to the rebirth of hope in ACC students. This past year has been an exciting one for Austin Community College (ACC). On August, 25, 2014, ACC concurrently launched a new campus that overhauled the idea of a college campus, introduced cutting-edge technology, and transformed a core curriculum using adaptive learning. The Highland Campus is the first phase of the redevelopment of the former Highland Mall. The Highland Mall opened in 1971 and for many years was the focal point for the entire central Texas region. Every time I introduce the project, there are always people that want to share their memories of going to the mall over the years. However, like many malls a variety of environmental issues (internet shopping, suburbanization, the recession, etc.) caused it to fade in recent years. Everything that made it a great location for a mall makes it a great location for a college. It sits at the confluence of several major highways. It is just up the street from The University of Texas at Austin and downtown Austin. It has great links to public transportation. The college began purchasing property at Highland Mall in 2010 and acquired the final mall component in 2012. ACC now owns all of the buildings as well as the mall land (more than a million square feet of space and approximately 80.8 acres). The project also involves Redleaf Properties (a private developer) who has options for the areas surrounding the mall that will be redeveloped as a mixed-use community. From the beginning of the planning, the reincarnation of the mall was envisioned as a center for innovative learning and a place where new ideas and technologies could thrive! We were space-starved at our older campuses and this new space will allow us to create a state-of-the-art learning environment and center for community and business partnerships and allow us to expand education opportunities for all Central Texans. While the initial focus of the space was born from the idea of the “math emporium”, it became readily apparent that we wanted to do something even bigger! This is Texas…we like everything BIG! MATD 0421 is the first of many courses to be redesigned and to be housed in the space. Instructors from all areas take advantage of being able to schedule on-demand space for hands-on, collaborative activities using the computer resources to facilitate learning. Whether it be for an entire course or for unique sessions, the ACCelerator is providing more opportunities for high-touch and high-tech experiences for students outside of the traditional classroom. In its first year of operation, the ACCelerator has served over 9,500 unique students in over 100,000 visits. In the Spring 2015 semester, the Department of Motion Graphics relocated from another campus and now offers its courses in the ACCelerator and is expanding their footprint. This fall, we are welcoming several new programs into the ACCelerator. The computer-aided design (CAD) department will be offering courses. A competency-based Accelerated Computer Training program will be offered as part of both a new Career Expressway program and our Early College High Schools. Math is continuing to spread increase its enrollment. We are extending our hours to midnight Monday-Thursday. Besides content-specific instruction through scheduled courses, the ACCelerator also offers tutoring, supplemental instruction, open computer lab access, and academic coaching. It is also home to the AARP Back to Work 50+ at ACC grant. In addition to students supporting one-another, we have five part-time “academic coaches” who are available for scheduled and drop-in meetings. They work with students who feel they “just don’t get it.” They are struggling not with a particular subject matter, but with what it means and what it takes to be a college student. The coaches work through a range of non-cognitive skills such as time management, organization, note-taking, test-taking and study skills. Over 400 students have seen academic coaches for support in these techniques and skills. This fall, we will be expanding the use of the coaches and partnering with faculty to introduce “nudges” to boost student engagement. Students are engaging with their learning in new ways. As a result, they come to the ACCelerator, they stay, and they return. Anytime we have the opportunity at a commuter college to engage with our students in these deep and meaningful ways, we know that it directly contributes to student success. Students are coming to the ACCelerator even when there are no scheduled classes on campus. They are coming before their classes and staying on after their classes. Students that don’t even have classes at this campus, use the space as a study resource. The space also means that there is “no back of the classroom”—the typical place where at-risk students tend to try and hide. The technology also used in the curriculum doesn’t allow for students to hide. Each professor knows exactly where each student is and this helps to create a much more personal connection with students. The withdrawal rate is significantly lower and the retention rate significantly higher in the developmental math compared to the traditional courses. Other courses taught in the ACCelerator express that the environment is much more like the professional environment that the students are already in or will be in their professional lives. 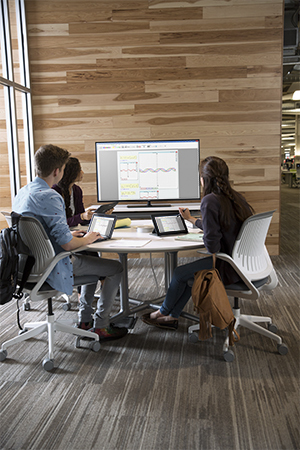 Courses that are scheduled in the space on an “ad-hoc” basis enjoy the benefit of having a flexible space that they can use for more collaborative and project-based learning. One of my favorite things is to be at the “Start Here” desk on the first day of a new semester and see the students arrive into the ACCelerator for the first time. You can tell it is their first time in the space by the look on their face when they walk in. First, they are first impressed by the sheer expanse of it all. Then, they realize that this is something different. It isn’t a traditional classroom where the focus is on many things but not necessarily on them. They can see in the way that we all interact that they are the focus of this new environment. I am reminded of one of my students, Rafina, who is an assistant in a nursing home. Last semester, she pulled me aside with tears in her eyes and thanked us for giving her hope back. “I’m 52 years old and I had given up on my dreams of becoming a nurse. But I can do math now in this program. You have given me my hope back.” This new environment isn’t just transforming their educational experience – it is giving them their hope back. Giving students hope that they can achieve their dreams through education is the reason that I am in the world of higher education in a community college. Launching a huge and complex hybrid initiative like the ACCelerator requires buy-in, support and investment from institutional leadership. Student are embracing the new incarnation of the mall and the opportunity to create a learning community. The space continues to evolve in new and dynamic ways in order to support student needs and improve student access and engagement.